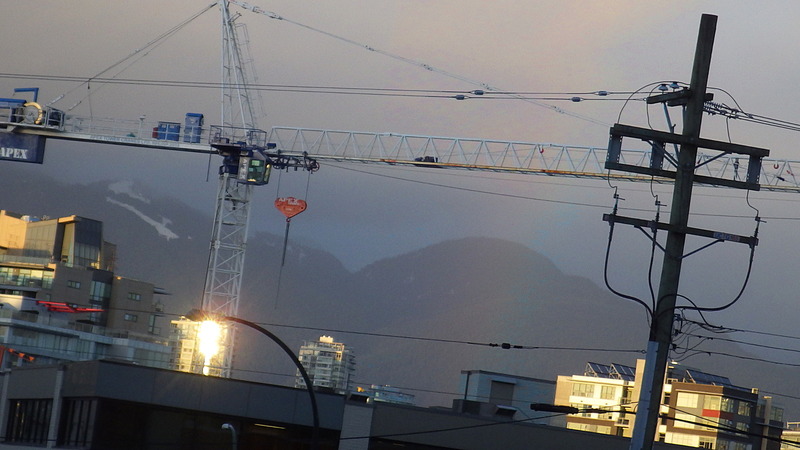 photo of a rainbow, Vancouver B.C. Looking north from Yukon Street and 7th Avenue at 4:35 p.m.
Late Thursday afternoon (February 28) I was lucky enough to see the tail end of a rainbow caused by the day’s on-again-off-again light rain. This was after I’d cashed in the majority of my day’s collection of returnable beverage containers at a recycling depot. I was on my way to a supermarket on the corner of Cambie Street and 7th Avenue to return the pile of high-value Avalon glass milk bottles I’d collected (worth a buck each). While I was still a block away from the supermarket, at the intersection of 7th Avenue and Yukon Street, I just happened to look up and see the rainbow in the northern sky. The mischievous trick of the light is going, going, gone. 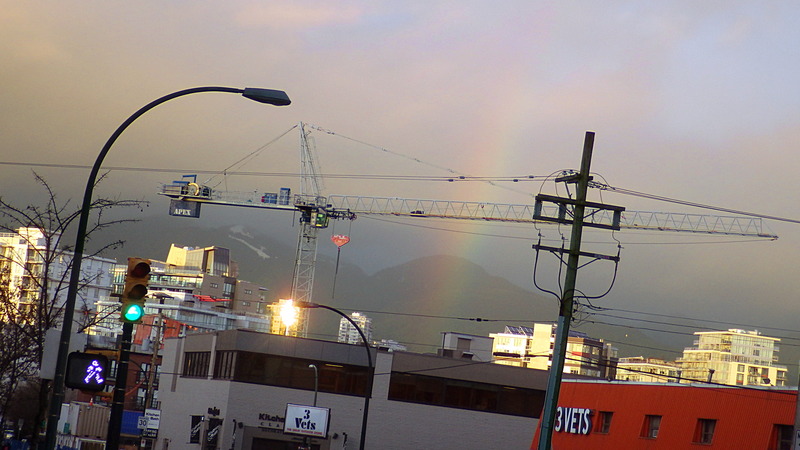 The way that it plunged straight down in front of the North Shore Mountains but behind the buildings of the Fairview neighbourhood, made it appear as if the pot of gold at the end of this particular rainbow had to be located on the far side of False Creek, somewhere in downtown Vancouver. I could see that the rainbow was steadily diminishing in intensity, so I was literally racing against time to prop my bike and trailer against a light pole and get my camera out. And it was a real photo finish. I was just quick enough to get two shots before the prismatic phenomenon completely faded away. Click the image to enlarge it. « The city uses car-proof bollards, why not sign posts?